I came across this photo in 2011, shortly after my mum died. When my dad died five months later, I became both the only surviving person from the picture and the only person who might know anything about it. The task for photographers is always to make a picture more interesting than what it depicts. But sometimes it’s only by knowing more about the things depicted that a picture becomes more interesting. So let me cover both bases, by telling you a few things about this photograph and a few things about the things and people in it. It’s important to stress, however, that they’re not just Housman’s hills; they comprise a geomorphological backdrop, as it were, to a cultural landmark of more recent formation: Dennis Potter’s television play “Blue Remembered Hills” (1979), about a group of children — all played by adults — in the Forest of Dean in Gloucestershire. My mum was born in Shropshire, my dad in Gloucestershire, where I was born and grew up and where my parents spent the rest of their lives. I’m guessing that the photograph was taken in Gloucestershire in 1963, when I was 5 (my mum and dad would have been 38 and 43 respectively). When I say, truthfully, that I have no memory of the picture being taken, I am conscious that this is meaningless because, of course, the photograph is memory. If I remember the weather in my childhood as being perpetually sunny, that is because photographs were only taken on days — rarer in England than in many parts of the United States — when the light was deemed sufficient, as though we were stuck in a 19th-century gloom of interminable exposure times. This picture, which seems like a pure emanation of memory, includes the person whose memories it represents: the person, that is, whose consciousness never included this view of himself. I have no idea who took the picture. As a result, and because it includes every member of our family — I had no siblings — something strange happens. An unknown friend, relative or passer-by must have taken the picture, but in the absence of clinching evidence to the contrary, it is not unreasonable to think that the place itself made a record of the day. Housman’s blue remembered hills have their memories, too. But those memories, unlike ours, cannot cope with change. Once the towns of Gloucestershire sprawl, once houses are built over areas like these, the memory of a landscape dies, literally buried by concrete. Hence the need for photographs. Without Walker Evans to remind them of how things once were, swaths of America would not know that there was more to their ancestral world than Bed Bath & Beyond. Evans’s work is stamped, always, by his capacity to rigorously absent himself from the records he created. This may be why James Agee, in his famous collaboration with Evans, “Let Us Now Praise Famous Men,” likened the camera “to unassisted and weaponless consciousness.” Paradoxically, the effect of Evans’s scrupulous mastery is sometimes achieved by the artlessness of the amateur. Hence the magic of — and meaning buried within — the term “found photographs.” In them, the nonhuman finds expression and achieves documentation. Moving from background to foreground, from the natural world to the mechanical, the car is a Vauxhall Victor. It looks like an American car of the 1960s, but less elongated, as though the U.S. model had been shortened for use in our narrow island. The car, bought new, really was sky blue, not white, but this is a blue that seems to have been tinted or stained by memory, by association with the hills, as when a white shirt emerges from the washer faintly dyed by a stray sock. Or it could be the other way round: maybe it was once as dark as my sweater, but the photograph has faded over time, the deeper color rinsed by age. Either way, the technology of the photograph imprints itself on the technology of the automobile. The car looks as it does partly because that’s what it looked like, partly because the photograph made it — along with hills, trees and clothes — look that way. The AD of the license plate identifies it as a vehicle registered in Gloucestershire, a source of pride to my dad, because those were his initials – Arthur Dyer, even though he was known by everyone as Jack or John. I prefer to think of the license plate as offering a kind of internal dating, AD 3489, as if this image from the past were a sci-fi vision — obsolete as these things often turn out to be — of what the future might one day look like. 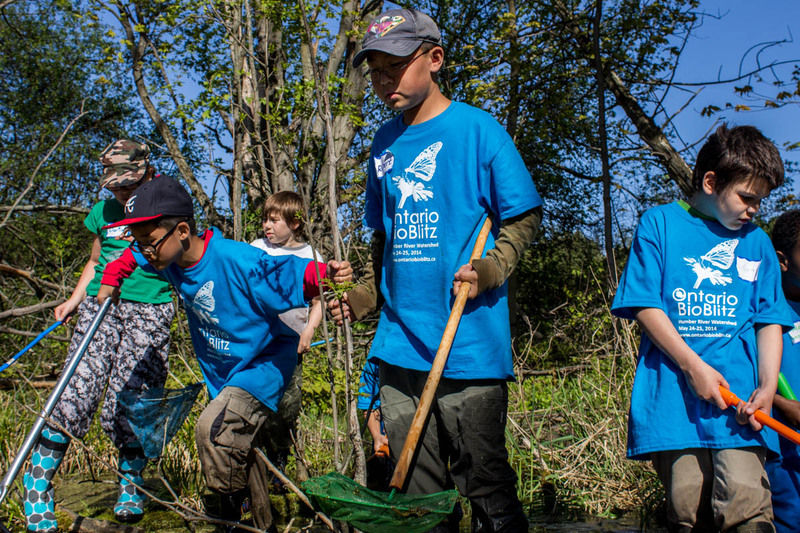 The 2014 Ontario BioBlitz was held this past weekend in the Humber River watershed. This 24-hour event is like a giant biodiversity scavenger hunt, combining the efforts of the ROM Centre for Biodiversity along with nine other partner organizations, 500+ registrants and volunteers, and this year's host facilities, the McMichael Canadian Art Collection and Kortright Centre for Conservation, to find and document organisms found in the watershed. As this blog post is being written, the total species count is at 1359, but with data still being processed and coming in from different teams, the total is expected to hit 1550 species or more! For ongoing species count updates, make sure to follow @ROMBiodiversity on twitter, and check out the Ontario BioBlitz website for more info. Hundreds of BioBlitzers get ready to start their intensive 24-hour search to identify and catalogue as many species of plants, birds, mammals, fish, insects, fungi and other organisms as possible. Photo by Vincent Luk. 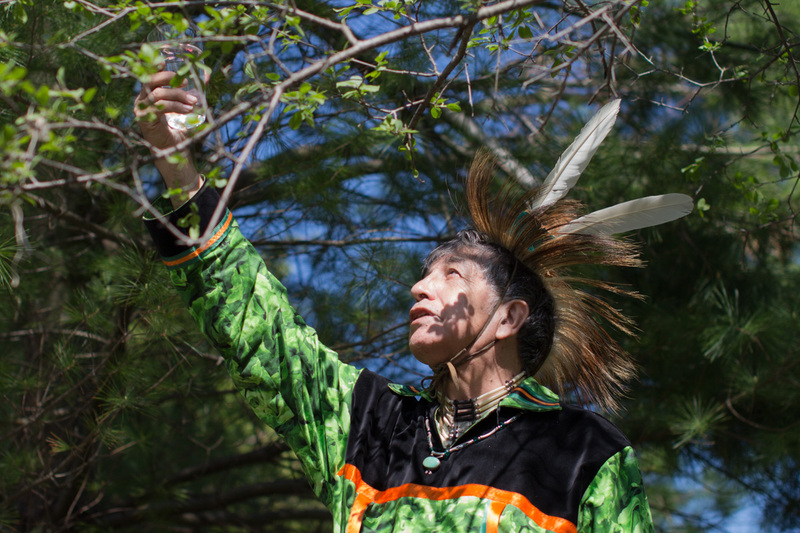 Ojibway elder Garry Sault of the Mississauga New Credit Nation blesses the BioBlitz and its participants within the Humber watershed with a traditional ceremony, reminding us that "water is life". Photo by Elli Levene. 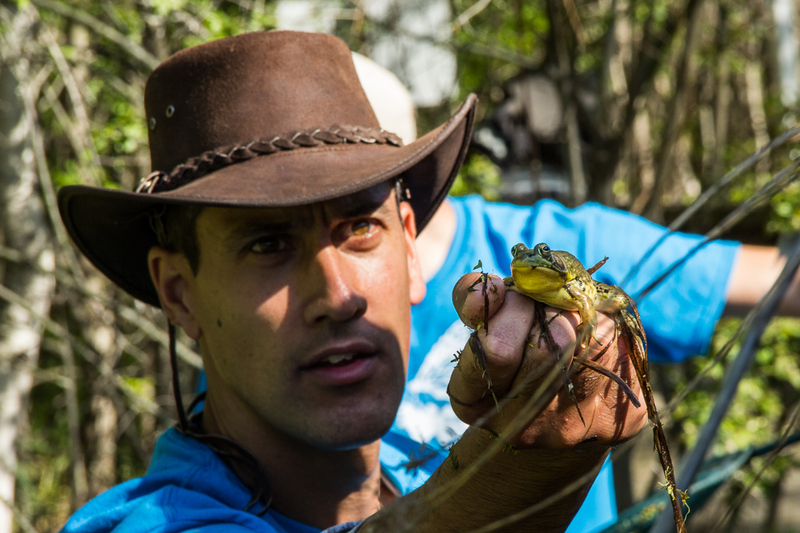 Fleming College professor Josh Feltham presents a green frog (Lithobates clamitans) caught in the wetlands of the Kortright Centre of Conversation to a group of Bioblitzers. Photo by Nila Sivatheesan. 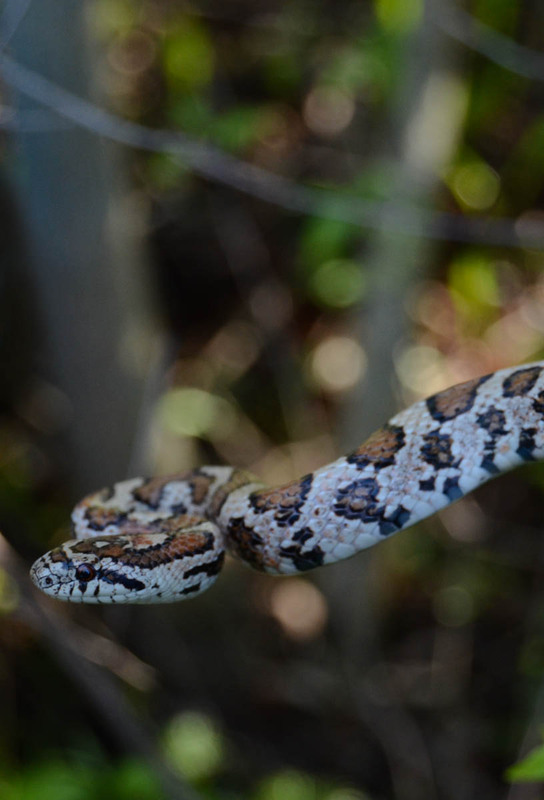 An Eastern Milksnake (Lampropeltis triangulum) spotted by Bioblitzers in the woods. Along with 10 other snake species out of the 16 found in Ontario, the milksnake is listed as a threatened species both provincially and nationally. Photo by Justine DiCesare. Excited kids explore a swamp, looking for amphibians to identify during one of the guided BioBlitz sessions at the Kortright Centre for Conservation. Photo by Nicole Di Cinto. Tukey vultures (Cathartes aura) warming up, possibly to scavenge Bioblitzer leftovers! 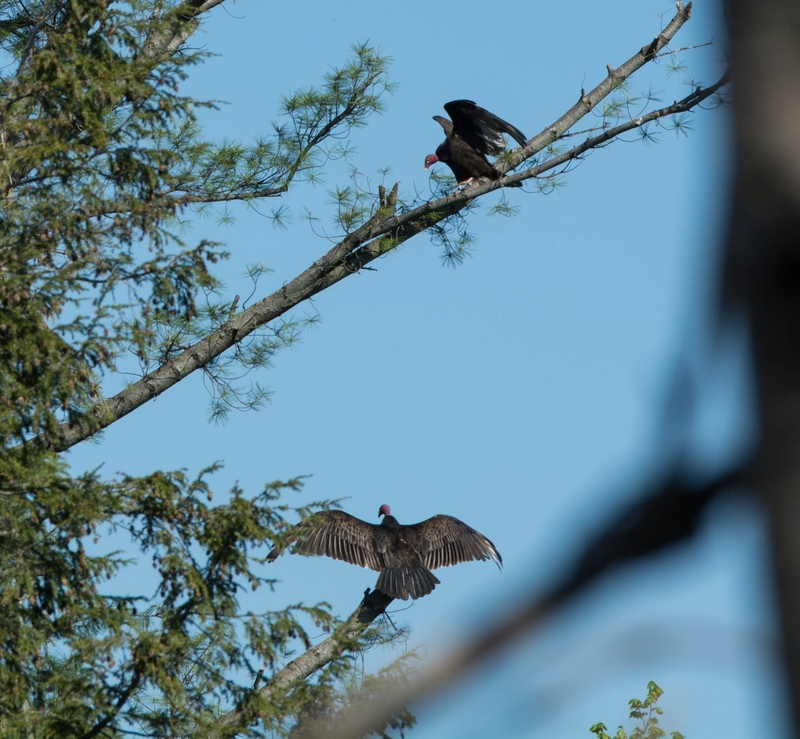 Did you know turkey vultures vomit on those that corner them as a defense mechanism? Photo by Dorea Reeser. 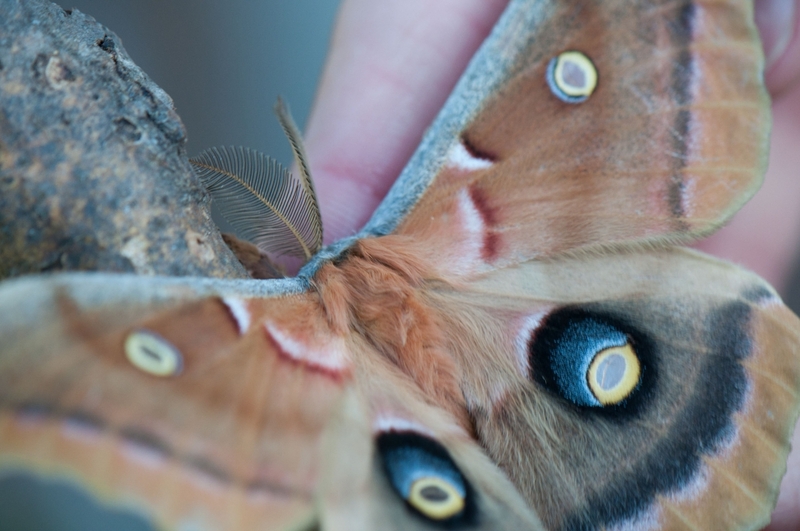 A Polyphemus moth (Antheraea polyphemus) found in the evening shows us moths can be just as beautiful as butterflies. Photo by Matt Jenkins. 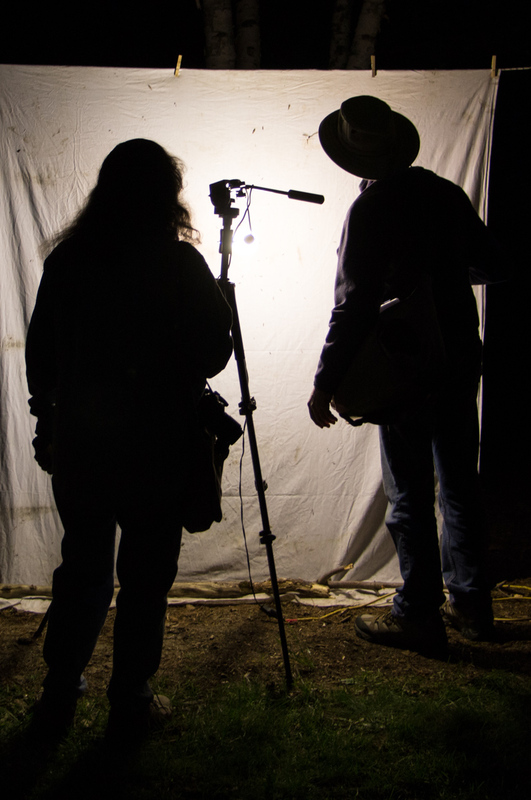 Moth man, Bioblitz taxon lead and naturalist, David Beadle (right), at work in his natural habitat - photographing Ontario night creatures. Photo by Holly Thomson. 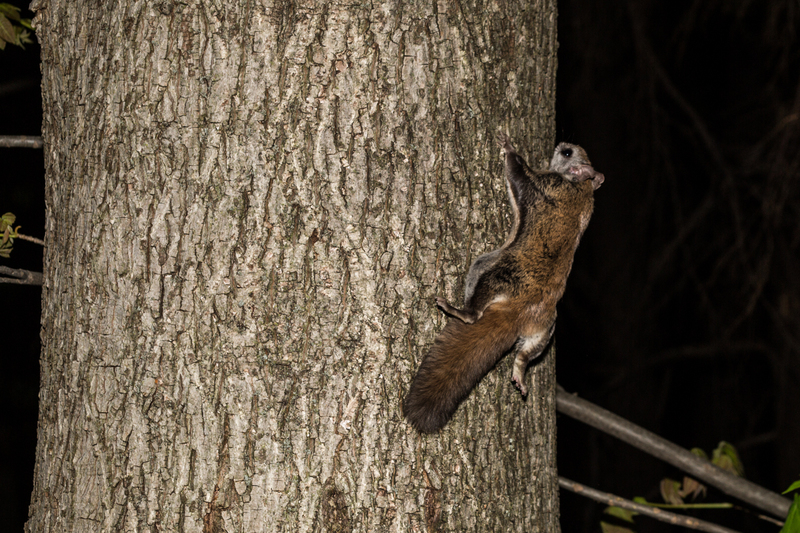 A northern flying squirrel (Glaucomys sabrinus) discovered by the mammal team late Saturday night behind the McMichael Canadian Art Collection. Photo by Tallie Garey. 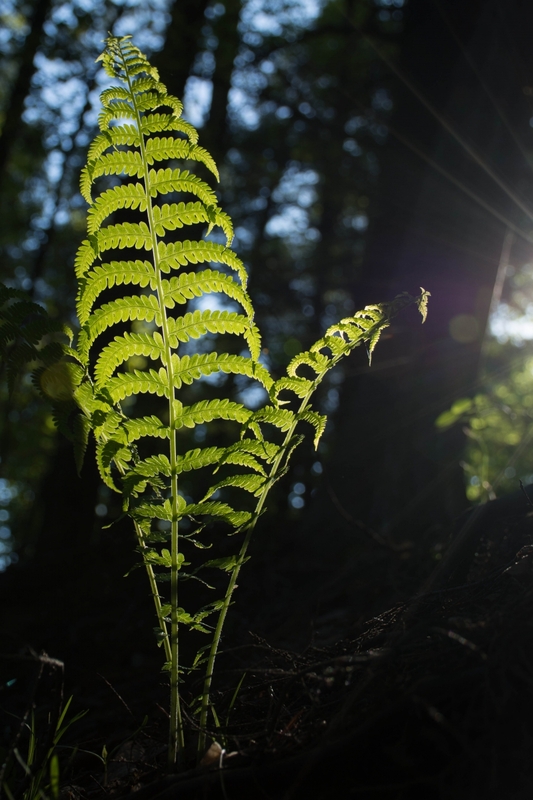 An ostrich fern (spp. Matteuccia struthiopteris) glows in the early morning sunlight of the second day of the BioBlitz. Photo by Tyler Talbot. A gorgeous northern black widow spider (Latrodectus variolus). 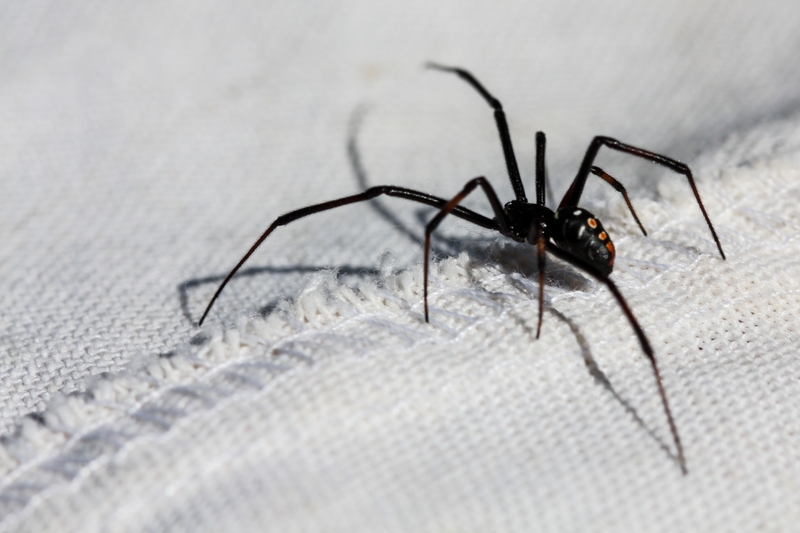 These spiders are rare in Ontario, and although their bites are venomous, they are non-lethal to humans. Photo by Vicki Simkovic, a student at the University of Western Ontario. Behind-the-scenes: Environmental Visual Communication students from the 2014 cohort prepare to capture the BioBlitz with their lenses from beginning to end. Photo by Lindsay Barden.